Have you ever had an idea for an invention, but you didn’t know where to start, or you just didn’t have the time to work on it? The Indiana Clinical and Translational Sciences Institute’s new deputy innovation officer, Jonathan Merrell, MD, is here to help. 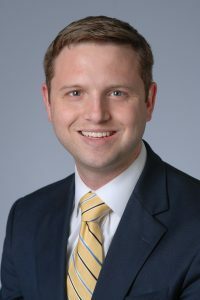 Dr. Merrell is an assistant professor of clinical pediatrics at Indiana University School of Medicine and a hospital-based pediatrician at IU Health, but he also has a background in biomedical engineering. He’s even in the process of developing his own medical devices. This experience and training uniquely positions Dr. Merrell to foster creativity in his fellow clinicians, as well as translate their ideas to engineers, who can figure out technical details required for specific projects. Dr. Merrell said there are three major reasons why most clinicians don’t participate in innovation: 1) they are too busy, 2) they don’t know how to get started, and 3) they lack the technical training to translate their ideas to engineers. This makes clinicians, with their vast first-hand experience with medical and patient-care problems, a huge untapped resource on the road to innovation, he said. One of the most impactful lectures Dr. Merrell said he has ever attended was his first class as an undergraduate biomedical engineering student. His professor told the class to go home and write down a list of 20 problems they could potentially address as engineers—a homework assignment that would become a lifelong habit for Dr. Merrell. Clinicians can work with Dr. Merrell to discuss and refine their ideas for innovation. Then, Dr. Merrell will do much of the work to disclose promising ideas to the appropriate technology transfer offices such as IU Research and Technology Corporation. And if a project is approved for development, he will remain in contact with the original inventors to ensure they continue to be involved in guiding the project’s evolution and success. Those interested can contact Dr. Merrell at jogmerr@iu.edu.